Over the years that we have been involved with internet marketing, we have tested and reviewed more proxy service providers than we care to remember. However, one company which has constantly been at the forefront of the industry for a number of years is Squid Proxies. If you spend any time on Internet marketing forums, chances are you have already heard of this company. They have a huge presence everywhere and a large customer base. Their reviews are positive, but we prefer to postpone our judgement of a service until we have actually tried it, so that’s exactly what we did. We decided to test both the private and shared proxies, using them to run an automated Youtube and Instagram account creation campaign. The emphasis of any automated campaign is speed and efficiency, with as little downtime or dead proxies as possible. One aspect of Squid Proxies service that we couldn’t help but praise was the ease of use. Everything just feels so intuitive. shared proxies and private proxies. This makes the whole purchasing experience from start to finish quick and seamless. As with all proxy service providers, the more you purchase, the cheaper they tend to be. With that being said, even at their most expensive ($2.40 per private proxy), they are still reasonably priced and cheaper than some of their closest competitors. If you are interested in purchasing thousands of proxies, the best option would be to choose Private, purely for the value that they provide for such a small difference (private proxies cost $0.10 more, per proxy when purchased in bulk). 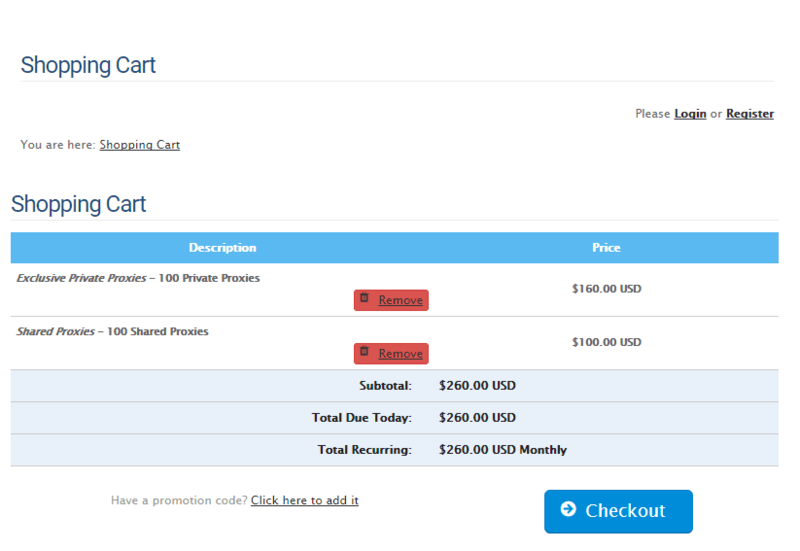 We decided to purchase 100 shared proxies and 100 private proxies. Total monthly cost was $260. The checkout process was simple and fast. Paypal and 2checkout were the only two payment processors available, but those two alone provide you with the ability to purchase with either Paypal or a credit/debit card. One of the key factors that we look at when reviewing a new proxy service is how long it takes them to deliver our proxies to us. We are an impatient bunch and don’t like sitting around, twiddling our thumbs while we wait for our proxies to be set up and delivered. Luckily, the processing speed with Squid Proxies was some of the fastest we have ever experienced. We had the proxies ready to use within a couple of minutes. Compared to some of the big names out there who can often take anywhere from 30 minutes to a few hours to deliver your proxies, this was refreshing to see. 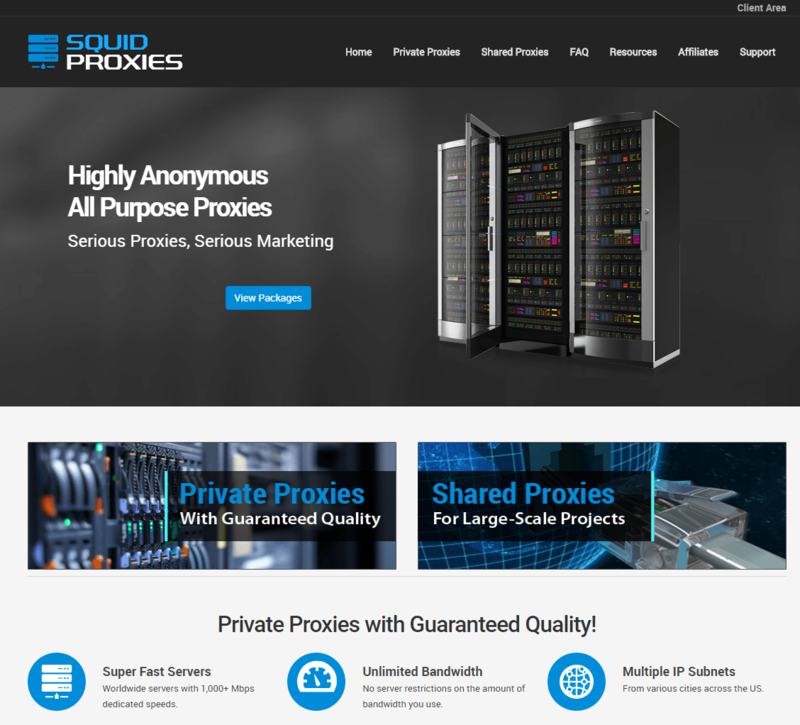 Squid Proxies boasts to have the largest network of proxies in the industry and they state on their homepage that they offer 1,000+ MBPS dedicated speeds with unlimited bandwidth. The proxies that we chose were all located in the USA, where Squid Proxies currently have 12 servers. If you need something a little further afield, they also have 13 other servers based all over Europe including the UK, Sweden, Romania, Switzerland and many more. Throughout our testing, we consistently hit speeds that we come to expect from both private and shared proxies. They did not blow us away in any way, but they were speedy and were consistent which is all that we need. From scouring the internet, we found that many users have reported slow speeds or laggy performances from their proxies, but we would be willing to bet that those issues have more to do with the users lack of knowledge in how to correctly set the proxies up for optimal performance. If you are struggling to reach the speeds that you expect from high quality proxies, or if you can’t get them to work at all, you can always reach out to their stellar support who will help to guide you through all of your issues. For the sake of this case study, we decided to send a quick email to Squid Proxies asking a random question that we didn’t even need answering. The objective was to test the speed of reply and the friendliness and keenness of their support staff. We received a reply within 30 minutes and the answer was in-depth and easy to understand. We wouldn’t have been happier with the support system. Of course, one email isn’t a conclusive amount of data to really give an informed opinion, but it’s enough for us to know that we have never received a reply as quickly as we did with Squid Proxies. Throughout or tests we never ran into any issues whatsoever with the proxies that we purchased from Squid Proxies. There was plenty of choice, the set up times were fast, the proxies performed extremely well and the support was fantastic. There’s nothing else to really say about this service. If you are in the market for affordable and high quality proxies, we would definitely recommend SquidProxies.com.